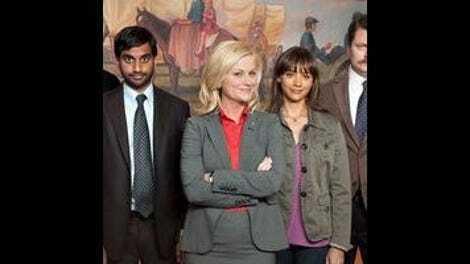 When Parks & Rec started out, like most comedy pilots, it was largely driven by plot. Leslie had a pit to fill and turn into a park, so each week was largely centered on her go-get-’em attitude and the obstacles that got in her way. But I don’t think it’s a coincidence that roughly around the time the pit was abandoned (and later filled—they dropped it before that happened), Parks & Rec got a whole lot better. I don’t tune in week after week to watch a comedy because I’m waiting for something to happen; I watch comedies because I love surprises. Sitcoms can establish a goal and throw hurdles up as much as they want, but we all know things will get resolved at some point. What’s truly surprising is when we learn something astounding about a character we’ve grown to love just because they’re around, not because they serve a larger part of a story. I absolutely loved “Ron & Tammys” because it completely caught me off guard. After last week’s episode establishing Leslie’s run for office, I expected at least one small part of the episode that followed to set up the rest of the season. I should have remembered that pit, though, and that Parks & Rec is at a place in its run where it’s just so giddy to let its characters have fun with one another. “Ron & Tammys” was just that: great one-liners, ridiculous send-ups, and silliness just because it felt like being silly. It was a hilarious ode to Parks & Rec’s characters. And Ron Swanson is a hell of a character—one of the best on TV today. What makes him so compelling is that the more we learn about him, the more mystery remains. It’s counterintuitive, too: Parks & Rec introduces very specific facts about Ron, like his fondness for breakfast food and the fact that he invests heavily in gold buried in several places around Pawnee (Or does he?). But rather than answering my questions about the character, the new information opens more doors, because I’m forced to think logistically about how Ron would have the time to go around Pawnee and bury all that gold. Assuming he does it at all. “Ron & Tammys” demonstrates that the deeper the show takes the Ron Swanson mythology, the more idiosyncratic his character becomes—but the more it all starts to make sense. At the end of last week’s episode, we caught a glimpse of Patricia Clarkson as the cold-hearted, unforgiving Tammy One. (Apologies for not mentioning her appearance last week, but since I’d already seen this week’s episode on the screener, I figured it was best to save all the discussion for this article.) She works for the IRS, and it turns out that Ron Swanson, a man who believes the income tax is illegal, is being audited. At first, Ron and the rest of the parks department try to handle the audit on their own; trying to make sense of receipts labeled “Bought supplies, 2007,” or photos of gentleman’s agreements, is far preferable to enlisting Tammy One’s help. But when it becomes clear Ron can’t handle this on his own (sign number one would probably be when Andy brings Leslie the Rolodex instead of a calculator), Ron and Tammy One join forces to handle the audit. It turns out that Tammy One, always the manipulator, only had Ron audited so she could get access to his financial records and see if a relationship with Ron was worth picking back up. It was almost too easy, too: After only one night with Tammy One, Ron has a whole new positive attitude about work, grants Tammy One access to his finances, and more importantly, shaves his mustache—the source of all his power. Leslie, concerned for her friend, asks him to lunch, and is horrified to see not only that he asks Tammy One for permission, but decides to bring her along. He’s once again in Tammy One’s grasp, as he was when he was born (literal grasp, here) and, subsequently, when Ron was 15 and they shacked up. Leslie knows she has to go right to the source; then when Tammy Two can’t help her, she heads to the other source—Ron’s mom. Tammy One and Tammy Zero are like the devil/other devil on Ron’s shoulder. They’re opposites, but pull him in two equally self-destructive directions. Tammy One wants Ron to be her little manipulatable plaything; Tammy Zero wants her little Ronnie back. (Hey, she might have called him Ronnie.) Both options require Ron to give up his freedom, and during the battle royale—drinking the stuff Ron’s pappy would melt marbles into and call his “punchin’ juice”—Ron is fittingly powerless. Thank goodness for Leslie Knope. She’s no Tammy, but she, like the others, wants Ron for herself. It just so happens that “for herself” means “Ron’s just Ron, and maybe he’ll scare some people away from asking for government funds every once in a while.” And had Leslie (or her Puerto Rican sub April) won the drinking contest , it would have still been a mighty fine episode of television. But one of the surprising things about “Ron & Tammys” is what the end of the battle royale says about Ron’s character. The episode itself explores Ron’s backstory, and lets the women who’ve shaped his outlook speak on his behalf. But just when Leslie’s about to tap out of the drinking contest, Ron steps in, downs the entire bottle of moonshine, and lays everything out. His willingness to stand up for himself, and for his friends, shows that even though he’s been pulled in multiple directions his entire life, he eventually found a place somewhere in the middle, and dug himself in deep enough that he ain’t going anywhere. It’s a wonderful celebration of who Ron Swanson is, and the show that made him that way. The rest of the episode seems like just an excuse for fun, but it ties in nicely with everything else that’s happening. Tom enlists Ben’s help for some Entertainment 720 financial stuff because a) Ben’s a huge dork, and b) Tom knows he can get Ben to do anything he wants. And because Ben’s such a stickler for smart spending, his visit to the Entertainment 720 office is the first time we can look at Tom’s empire and see how ridiculous and wasteful it is. He and Jean-Ralphio employ models to sit around and read iPads, and pay them $100,000 a year, plus full medical. Roy Hibbert and Detlef Schrempf play basketball and lift Jean-Ralphio so he can dunk. There’s a pile of free iPads to give out when visitors come, and a party button that makes Tom dance like a maniac. Tom abuses Ben’s eagerness to help, but ultimately isn’t ready to hear what Ben has to say: Entertainment 720 will be broke by the end of this sentence. He eventually comes around though, and begins to see his business decision in the cold, harsh light of reality. It turns out, he’s not as oblivious as he seems to be. But you know who’s really oblivious, and probably more than a little crazy? Chris. In “Ron & Tammys,” Ann decides to create a new diabetes-awareness video, and asks Chris, a fit and articulate guy, to star in it. Chris is already a bit of a perfectionist, and his pursuit of the perfect video draws Ann, and himself, totally bonkers. So much so that Ann begins to question what it was she saw in Chris romantically to begin with. Seriously: Rob Lowe gets the crazy eyes. I feel like I’ve gone on about “Ron & Tammys” for a while now. It was just such a great episode. All three stories tell fun and interesting tales about Parks & Rec’s beloved characters—doing so by taking whatever personalities we already know, and dialing them way up. Nothing in “Ron & Tammys” had to do with Leslie’s impending run for public office, or the end of her relationship with Ben; in fact, Leslie and Ben don’t even spend time in the same room. 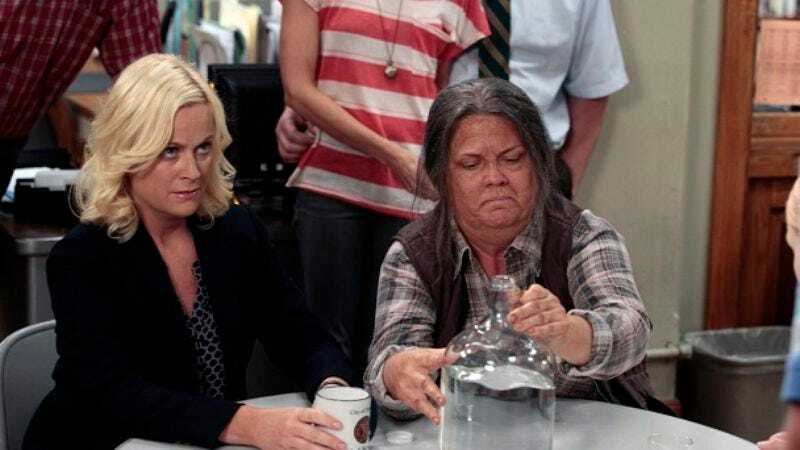 Parks & Rec loves gleefully pushing expectations of how its characters are going to behave, and “Ron & Tammys” throws itself into that effort full-force. Tammy One is responsible for the coldest, most calculated “na na na na na” I’ve ever heard.